To view the cover pages available to your account you can select the cover page icon. After you select the cover page icon you will see the options to select from All cover pages, Shared cover pages, and My cover pages. 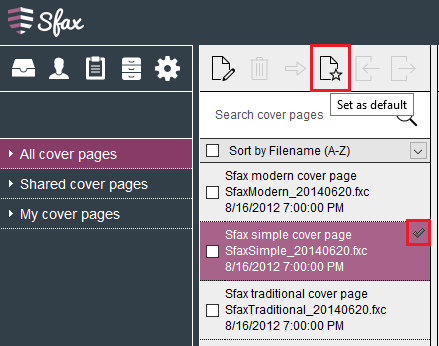 If you select All cover pages you will see all that are available to your user account. 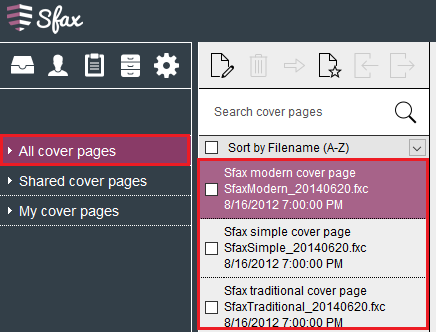 Sfax has three default cover pages you can select from. Sfax modern cover page, Sfax simple cover page, and Sfax traditional cover page. Each cover page has been created to populate the various fields based on your user information as well as information input into the Subject, Reference, and Remarks field when preparing to send a fax. If you select one of the cover pages you will see this displayed to the right where you can view the design. 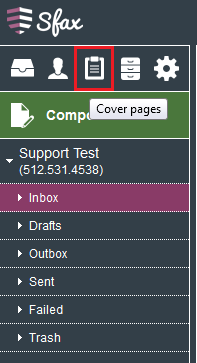 If you would like to set a default cover page, then select the cover page and click on the Set as default icon and your default selection will be marked by check mark as shown below.